The diagnostic first walls, weighing up to 2 tonnes, protect the diagnostic instruments from thermal loads, neutron damage, coating by dust and metallic vapour deposition. From 8-9 December 2014, years of effort and international collaboration paid off as the Final Design Review for the diagnostic first wall was successfully held at ITER Headquarters. 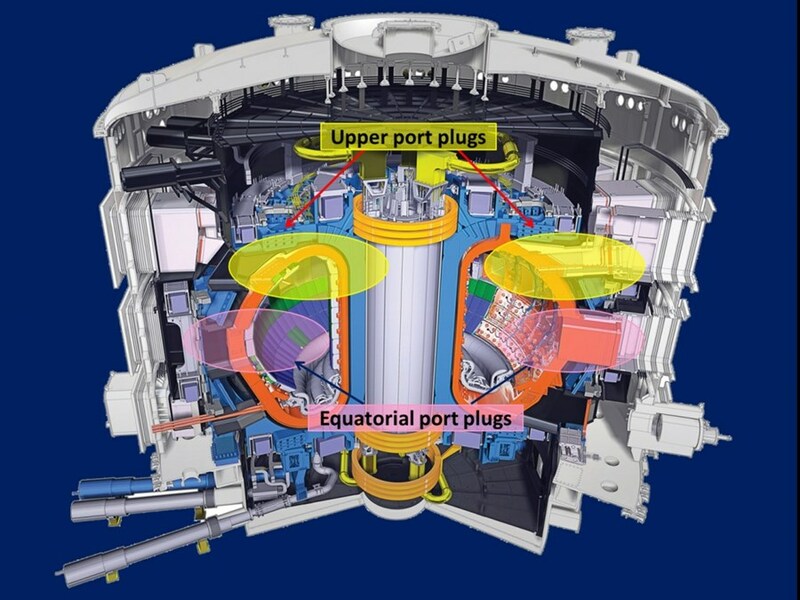 ITER diagnostics will be housed within massive port plugs—stainless steel blocks weighing up to 45 metric tons (for equatorial ports) that "plug" openings in the vacuum vessel. At the equatorial (middle) and upper levels, at least 18 port plugs will be customized to receive diagnostic instruments that will measure plasma temperature, density, radiative properties and first-wall resilience. These sensitive diagnostic instruments need protection from thermal loads, neutron damage, coating by dust and metallic vapour deposition; for this purpose, a diagnostic first wall is installed on the port plugs. The Final Design Review focused on design aspects that are common to all diagnostic first walls. With a total of 108 pages each, the design reports carefully went over the design requirements, the detailed geometry, and the manufacturing studies of the equatorial and upper port diagnostic first walls that were felt to reflect a wide range of diagnostic first wall configurations. In addition, all the basic configurations and common features were evaluated to allow extrapolation, later on, to specific diagnostic first walls. The joint efforts of the ITER Diagnostics team and the Princeton Plasma Physics Laboratory—working under a design Task Agreement signed between the ITER Organization and the US Domestic Agency—concluded with a successful Final Design Review and a team commendation during the ITER Recognition Ceremony held in December. The members of the team are Victor Udintsev, Thibaud Giacomin, Julio Guirao, Christian Vacas and Silvia Iglesias from the ITER Organization and Douglas Loesser, Mark Smith and Yuhu Zhai from the Princeton Plasma Physics Laboratory.